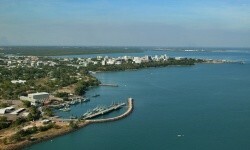 Darwin is the Northern Territory's capital city located on a peninsula at the top of the state. Darwin has a warm and tropical climate all year, making it a great holiday destination year round. It is an excellent base to explore the Kakadu National Park, learn about Darwins part in World War 2 and to discover the regions rich cultural history. Darwin is home a population of approximately 100,000 people, with people of a variety of different nationalities residing here. This cosmopolitan city attracts travellers and workers from around Australia with its population changing in time with the seasons. Darwin City features many public outdoor areas and visitors will notice the relaxed outdoor lifestyle that locals enjoy. There are many markets, festivals and events throughout the year celebrating the cultural diversity of its population. Darwin has had a turbulent past and has changed dramatically throughout history. Darwin was used as a military base in World War 2, with bunkers and air strips still evident around the city. Not long after in 1974, Darwin was hit by a vicious cyclone and was nearly completely rebuilt. The popular Museum and Art Gallery of the Northern Territory is a great place for visitors interested in Darwins history. There are many things to see and do while in Darwin, and the city provides an excellent base to explore the surrounding regions and natural attractions, such as the Kakadu National Park, Arnhem Land, Litchfield National Park and the Tiwi Islands. Accommodation options include hotels, apartments, resorts, motels and backpackers/hostel accommodations.